As I am reading Reynold’s Discourses on Art at the moment, I thought it would be appropriate to honour him with January’s PotM. The published lectures were given between 1769-1790, while he was President of the Royal Academy of Arts. In his Discourses Reynolds wrote extensively on both the intellectual and physical requirements for creating a perfect artwork; one that was compositionally balanced, demonstrated correctly applied perspective and proportion, and had tonal harmony. The culmination of these elements would result in something that was beautiful as well as mentally stimulating. As well being the authority on art theory, Reynolds was the most popular portrait painter of his time. Anyone of any social standing wanted their likeness to be painted by him, and when looking at this portrait it is easy to see why. 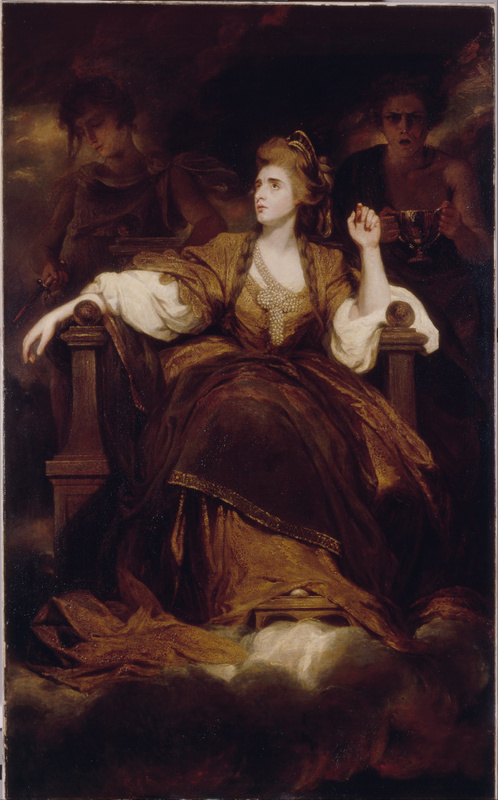 As the leading actress of her day it is only natural that Sarah Siddons should be depicted as Melpomene, the Greek muse of tragedy and goddess of music, song and dance. In the 18th century it was quite usual for sitters to pose for portraits in character, and Reynolds was famous for using allegory in order to portray a deeper psychological analysis of his client’s personality. Particularly celebrated for her Shakespearean roles, Siddons was beautiful, statuesque, and was a fantastic dramatist by all accounts. Her body fills most of the canvas, recalling Michelangelo’s monumental Sistine Chapel pendentive Prophets. Poised regally in a throne, one hand raised as if gesticulating mid-sentence, and the other draped with attitude over the arm of the chair. She appears to be reciting a soliloquy or experiencing some kind of rapturous moment of inspiration. Figures symbolising Pity and Terror recede into the darkness behind her, perhaps whispering into her ear. She is dressed elaborately in stage costume, and wears a tiara and an enormous knot of pearls. Dramatic is a good way to describe this painting, and in a way this portrait is a performance. Although history painting was regarded as noblest subject for art, Reynolds elevated humble portraiture to a new level, using the Grand Manner. He believed that painting was a language, with its own grammar and structure that should be studied industriously to get it right. As well as learning from the Old Master painters, an artistic instinct and imagination was required to create a masterpiece. This portrait is unique, beautiful, and intelligent – a culmination of everything Reynolds so firmly believed in.